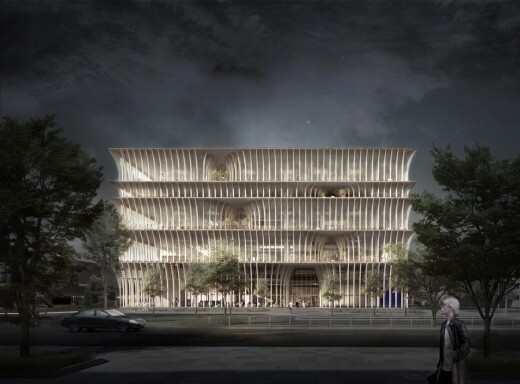 spatial practice design for the Varna Public Library Competition has been shortlisted and selected 3rd place among the winning entries. 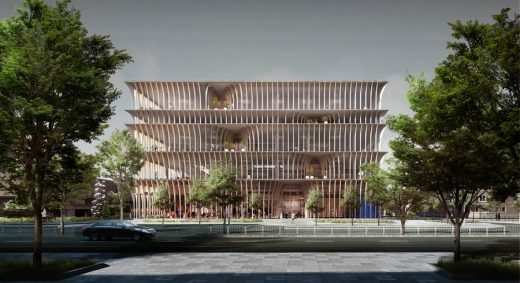 The design of the 28,000sm public library was selected among 370 entries. Today, the impact of virtual and digital influence is quite often celebrated through social media and other mediums, we live in a world today that aspires to be more connected and exposed. The role of public space is being redefined. No more traditional mono-functional spaces that allows one program to manifest, rather platforms that allows anything to happen is the real tool of design in the urban realm – place where different things could happen and different sections of society could meet. Libraries today are still functioning as a castle in a city, a place that holds books and allow readers to enjoy that moment. The relationship between in and out, old and new, archive and collection is seen as a wind that pushes you to the future rather than an anchor that holds you back. 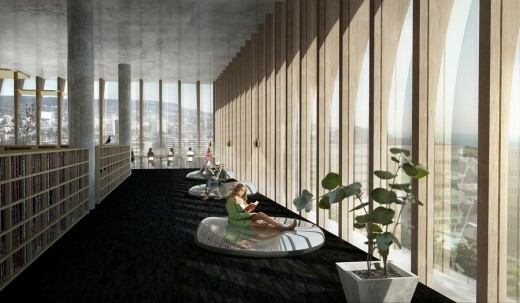 The Varna Library is an attempt to break the typical configuration of a library, a place where the ground is liberated and become the city “Living Room”. A place where visitors and library goers can meet and exchange ideas and promote knowledge, while at the same time allow the citizens to have an extension of their own living room. 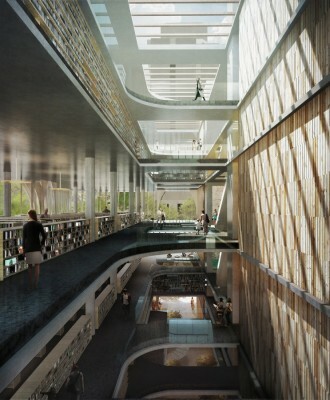 The atrium serves as a vertical living room allowing sections of the library to overlap and expose different kinds of visitor interaction – to meet and exchange ideas – the Vertical human promoter. 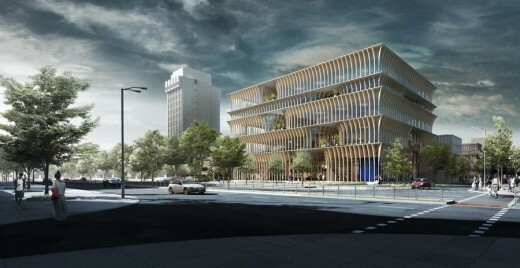 The design grows from the existing public space network, utilizing its unique site relationship with the adjacent Municipal Hall; as visitors strolling along Varna’s green public passage are led into the new Library. The green belt is extended into the design with green pockets on every platform of “Knowledge” seamlessly integrating landscape with reading spaces; thus blurring the relationship between close and open, free and paid. The library floats above the heavy concrete archives that hold Varna’s vast library collection and history. The relationship between old and new, past and future is conceptually built to help mitigate the relationship. 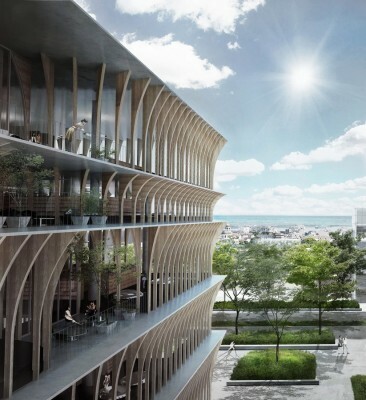 Recalling Varna’s history with timber and commitment to sustainability timber mullions provide warmth, elegance and softness to the surrounding concrete neighborhood. The folding facade lures visitors into the internal street; bringing a new element to the existing public space system. The rigid, flexible floor plates become playful with free flowing reading spaces at its periphery. The library embodies the idea of reading on a wooden terrace, feeling a gentle breeze, overlooking the sea.